These have to be the coolest Bluetooth Speakers on Amazon!! They will be a hit with anybody who loves to stream music through Bluetooth Speakers. These Smart LED Light Bulb Bluetooth Speakers would be a wonderful gift idea for a tween or teen!!! 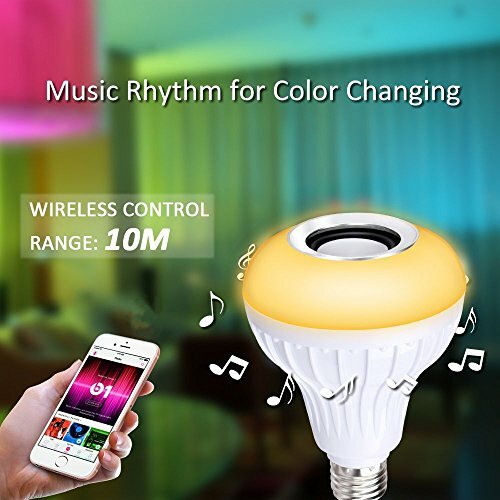 Essentially, these are LED light bulbs that come with access to a free app you can download to your Android or Apple phone or device that allows you to stream music to the Smart LED Light Bulb Bluetooth Speakers, and you can control the color of the light emitted & also choose different light effects. These Smart LED Light Bulb Bluetooth Speakers would make an Instant Dance Party! These are so much fun!!! Hurry and get the Ustellar LED Wireless Light Bulb Speaker, RGB Smart Music Bulb, E26 Base Color Changing with Remote Control for Party, Home Decorations today for only $13.99 from Amazon! Check out all of the recent Amazon deals here! These Smart LED Light Bulb Bluetooth Speakers come with fantastic reviews!!! Amazon Prime members get FREE 2-day shipping!! If you are not a Prime member, get FREE shipping when you purchase $25 or more of eligible items across any product category. Get the Bluetooth Speakers details below. Buy the Ustellar LED Wireless Light Bulb Speaker, RGB Smart Music Bulb, E26 Base Color Changing with Remote Control for Party, Home Decorations from Amazon. Next articleSave BIG with Staples Coupons! (exp. soon) Print now!